We are a burnishing and polishing company. Hotels, country clubs, restaurants and residents trust The Swartz Group to bring their precious metals back to a bright finish. We work in-house or in our shop, specializing in silver and stainless steel flatware, holloware and trophies. 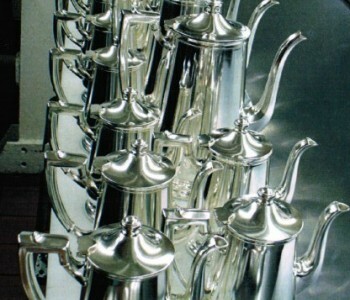 Our maintenance will keep your silver, stainless steel, copper and brass in service maintaining a uniform finish. We provide continuous inventory for our commercial customers. The burnishing process smoothes the nicks, fades the discoloration and polishes the metal to its original condition. Your guests will notice the immaculate shine our tools bring to your utensils. Antiques and collectibles can be brought back to use. Trophies can be displayed again. Contact us. We are friendly and helpful. Don't hesitate - no question is too minor or explanation too long. The Swartz Group burnishes and polishes silver and stainless steel flatware, holloware and trophies. The burnishing process removes the everyday nicks and polishes the dullness to a bright finish. Our maintenance service is a proven method to keep your flatware and holloware looking great for a long time.